Nikon’s D7200 is a versatile DX-format DSLR that caters to both still photography and video users. Featuring a 24.2MP CMOS sensor which lacks an optical low-pass filter, and an EXPEED 4 image processor, the D7200 is able to record up to 6 fps at full-resolution, or 7 fps at a 1.3x crop, with a 100-frame buffer for extended high-speed shooting. This sensor and processor combination also avails a top native sensitivity of ISO 25600, which can further be expanded to black & white-dedicated ISO 51200 and ISO 102400 sensitivities. Full HD 1080p video recording is supported up to 60 fps in MOV format. While, how about the editing workflow of Nikon D7200 in Final Cut Pro? UFUWare HD Converter for Mac is the software we would recommend to transcode Nikon D7200 MOV to edit in Final Cut Pro as well as Avid MC, iMovie, Final Cut Express, Premiere, Vegas, Pinnacle smoothly on Mac OS X(Mountain Lion included). With this Nikon MOV converter, you can transcode D7200 files into Apple ProRes, ProRes 422 (LT), ProRes 422 (HQ), ProRes 4444 that Final Cut Pro recognizes natively. It ensures maximum editing quality and efficiency when working with Final Cut Pro X or FCP 7/6. Just download and follow the brief guide below. 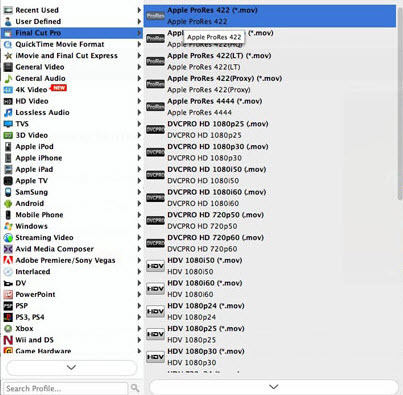 1.Download HD Video Converter for Mac. This professional HD Video Converter that can help you convert Nikon D7200 1080P H.264 MOV files to Apple ProRes 422 MOV format for Final Cut Pro, more output formats are also supported. 2.Install and launch this Nikon D7200 Video Converter Mac. Import Nikon D7200 footage to the converter. 4.You can click “settings” to customize the output parameters, adjust the resolution, bitrate as you want. With this Nikon D7200 1080P H.264 MOV to Apple ProRes 422 converter, you can easily convert Nikon D7200 files to FCP X/6/7 best codec, and then you can import the footages to FCP for editing on Mac, please take a free try, hope this software can help you.